Harray Potter Ltd. | Fursbreck Pottery Orkney makes and sells pottery, runs courses and provides self-catering holiday accommodation. 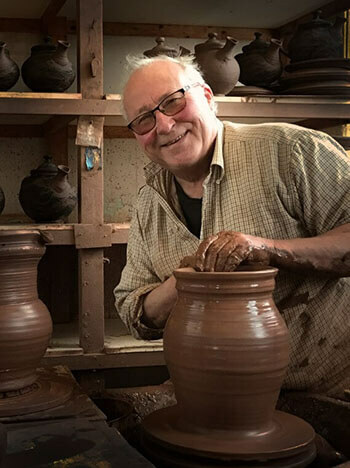 Welcome to the website of master potter Andrew Appleby, the original Harray Potter! Fursbreck Pottery Orkney is a family business where we make and sell pottery. Andrew’s debut novel ‘Skara‘ in his Neolithic series ‘New Life for Orkney‘ is now available to purchase in paperback or eBook format. Visit our Pottery and Shop in Harray Orkney, watch us throw pots and choose from our full range of pots, plates mugs, jugs and much more! Can’t visit Orkney? Not to worry, we sell our ranges online and accept secure payment with your debit or credit card via PayPal. Orkney Prehistoric Pottery Research Associates (OPPRA) was formed in 2007 by potter Andrew Appleby and archaeologist Stephen Harrison with the aim of undertaking experimental research into the making of prehistoric pottery.